Attention Saturday Night Live fans: Gilly and Penelope are no more. But are the right girls getting the boot? Kristen Wiig announced her popular characters’ demise in a Times article promoting her upcoming movie Bridesmaids. Lorne Michaels didn’t kill the characters; Kristen did. She felt — with good reason — that their time had come and gone. Funny that she doesn’t have the same good sense about herself. But her other female contemporaries have moved on to bigger and better things — Tina Fey to 30 Rock, Date Night, and the smash best seller Bossypants. Amy Poehler is on the funniest sitcom on TV today, Parks & Recreation. And Maya Rudolph is splitting her time between babies and movies, her latest the aforementioned Bridesmaids with Wiig. Wiig is no less talented than those who have gone before her…and she’s certainly had no trouble scoring movie roles the last few years. She just can’t seem to cut the SNL apron strings. Abby Elliott. Vanessa Bayer. Nasim Pedrad. And the writers, whose sketches of late already seem to be favoring the younger blood in the cast. Leave while you’re on top, Kristen. Wait around much longer and people are gonna confuse you with Darrell Hammond. In the two years since she left the show, she’s been back numerous times to do stints on “Weekend Update,” imitate Hillary Clinton, and guest star on the Betty White special. She still seems like a member of the cast. Why bring her back now as a “guest host,” especially when the show is introducing four new cast members? The two new girls — Vanessa Bayer from Second City and Taran Killiam from The Groundlings — will already have to fight tooth and nail for every moment on stage, since most female roles seem to go automatically to Kristen Wiig. Now you’re adding Amy Poehler to the mix…so all they can hope for is the rudimentary waitress role or maybe the face-in-the crowd scene. If they get lucky, they’ll be a reporter asking a question from the audience. Don’t get me wrong. When you consider all “Saturday Night Live” femmes — current and former — Amy is near the top of the list. She’s not only an amazing improviser, character actor and comedienne, but in all interviews and conversations, she appears to be a down-to-earth, nice person. That is a rare compliment indeed in that business. But half the fun of “Saturday Night Live” is bringing in an A-list celebrity who’s not the first name in comedy and seeing what they can do. Remember how unexpectedly great Peyton Manning was as a guest host? Or Brian Williams from “NBC Nightly News”? Even a great dramatic actor can quickly lose his footing on SNL — or be amazing like Christopher Walken. And that’s what we want to see…not a very-very-recent cast member who seems like she never left. So, while I’m sad Amy’s sitcom “Parks and Recreation” is on hiatus until mid-season — and she’s no doubt looking to fill her schedule — I think there are plenty of other celebs out there (not to mention the new cast members, hello) who are chomping at the bit for the opportunity to show what they can do in the comedy arena. But Amy? Girl, you’re good to go. Give our best to Will and the boys. 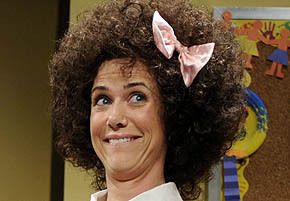 Kristen Wiig is on the talk show circuit. She’s promoting the MaGruber movie, which opens in theaters May 21st. Critics say it’s the funniest movie to come out of “Saturday Night Live,” and the trailers I’ve seen so far support that. It’s great to see Kristen doing more film work. She’s one of — if not the — funniest women on television today, and has managed to steal scenes with the small roles she’s had to date in movies like Knocked Up and Ghost Town. So, I was excited when she told Jimmy Fallon last night that she is shooting a movie this summer that she co-wrote. I could only imagine the hilariously creative starring role that Kristen would write for herself. Get this — it’s a wedding movie. Circa Bride Wars. But she’s not the bride. She’s the friend of the bride, fighting to plan the wedding for her bride friend. Wow. That’s amazingly original. It’s so original, I used a recent, poorly rated and received movie to describe it. Don’t get me wrong — I want it to be amazing. With Kristen and Maya Rudolph as her co-star, it has tremendous talent and potential. I just hope the movie can transcend its very tired stereotype.